Like many others, I woke up this morning having a hard time processing the results of the presidential election. Just yesterday, I saw a colleague copying an article for her class and asked her if I could grab a copy. I scanned the 3 pages: "Donald Trump. Hillary Clinton. Who Will America Choose?" Even that made me feel a knot in my stomach. 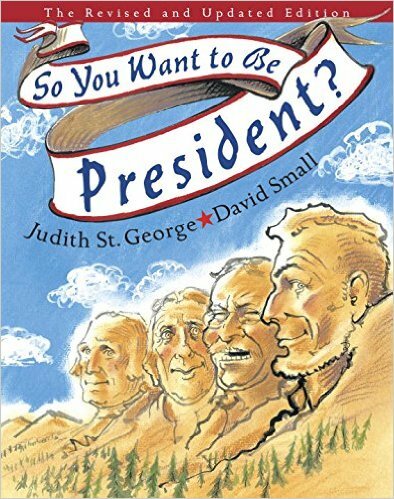 So yesterday I read them excerpts from "So You Want to Be President." I taught about the electoral process, and I gave them a writing prompt that I tend to save for President's Day: "If I Were President..." and we spent time sharing those sentiments. But in the end, I didn't even copy the booklet my colleague used. I didn't mention the candidates by name in my classroom. So this morning I felt a stress headache from not just trying to come to terms with the future of my country/the world, but also from the pressure of figuring out what to say to my students. I knew I could not have a Morning Meeting with my class and ignore it. It WOULD come out at some point, and I needed to steer the conversation in the best direction possible so that they had some common ground and normalcy to refer to. So during Share Time, I showed them my sticker. 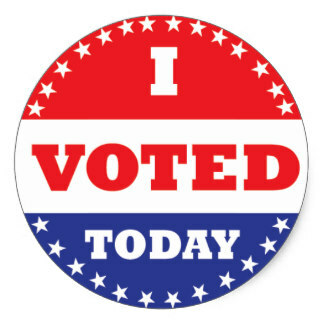 I told them, "I voted yesterday, and I got this sticker. And so did my husband. It was his first vote as an American citizen. Raise your hand if you voted yesterday too. Does anyone have any questions?" Of course the kids started talking all at once. When alluding to the hot topic but not preaching about it, kids in classes who feel safe will always name the elephant in the room better than adults. In that regard, the pressure is off me. I take time to listen to what they already know. Chris said, "We don't talk about politics in school." I said, "Actually, the nice thing about being in a free country is we are ALLOWED to talk about politics in school. But also, we can not be FORCED to talk about politics in school." Another student asked me who I voted for. And I answered the way I always do. I said that although we are allowed to share that information, I choose not to. I explain it's because I don't want to influence them about a single person, because they won't be voting for that person when they turn 18 anyway. I'd rather teach them to think about what it means to be a great leader and make their own choices. Then Chris raised his hand. "So who won the election?" And I answered, "Donald Trump won." And there were cheers and chants and connections made between him and a famous duck with the same given name. All while he curled up in a ball and fought back tears. Then a girl raised her hand and said, "Donald Trump makes fun of girls." That was definitely my most challenging moment to endure with my students. I nodded, and let the comment hang in the air for a moment while I collected my thoughts. I reminded myself, "Teach ideals. Not people." And I took a deep breath. "Did any of you write yesterday, 'If I were president, I would make fun of people?'" "What did you write about?" "Share money with people who are hungry." And then I reminded them of something we talk about a lot. "We all make mistakes. And every time we make a mistake, I tell you, try to do better. Hopefully Donald Trump will try to do better, and do some of those great things you wrote about." The kids looked more convinced than I felt, so I decided it was time to gently steer the conversation away from Trump's character. I asked, "So who knows who the president is now?" And they all said, "Donald Trump!" "It's Barack Obama!" I explained that he is the "president elect" so he WILL be president, but not until January. "Remember in the book we read, there will be a big ceremony, and he will have to promise to do his best to lead our country." Then one of the kids asked, "So does Donald Trump have to learn to be president now?" "He sure does. And he's got 2 months to do it."